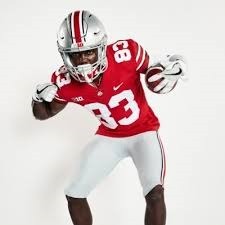 Ohio had a deal of great news on Monday when their third and final receiver Terry McLaurin tweeted his intent to return to school for another year. This puts Ohio State's receiving core back together for another year. Certainly with J. T. Barrett's departure this year it will help the new quarterback transition with the team to have those standout wide receivers to throw to. Couple this with junior Johnny Dixon making his exciting touchdown plays and the receivers at Ohio State will give defenders nightmares.